Last week, I wrote a post in which I proposed that the feast of All Saints perhaps originated not with the dedication of the Pantheon as a church, as is traditionally stated, but in the Papal response to the iconoclast heresy in the 8th and 9th centuries. Here I will consider rather more briefly something else which may fit in with that idea. 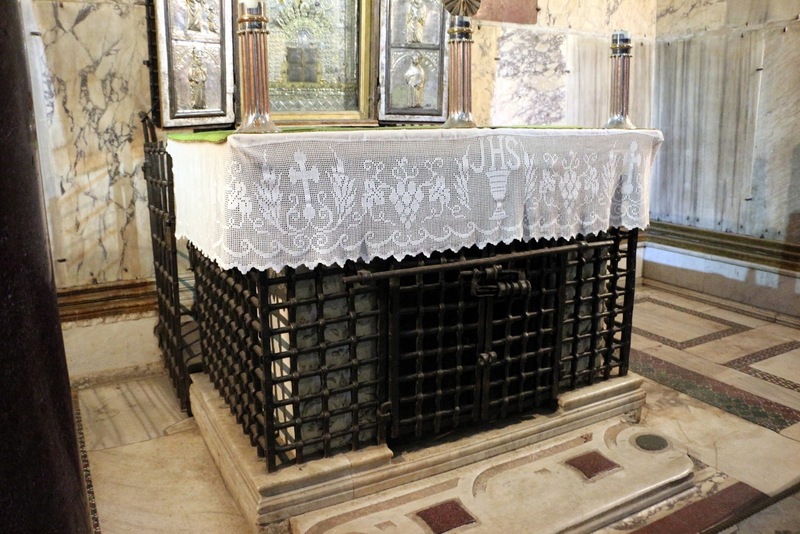 As I noted earlier, part of Rome’s answer to the Byzantine emperor’s rejection of sacred images was the building of an oratory at St Peter’s Basilica, which Pope St Gregory III dedicated to all the Saints, filling it with sacred pictures and relics. 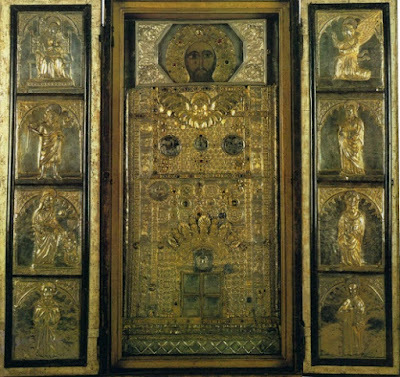 This was one of several major artistic projects by which the Pope declared the Church’s opposition to iconoclasm, a policy continued by his successors. In 753, during the reign of Pope Stephen II (752-57), the Emperor Constantine V held a synod in the imperial palace at Chalcedon to confirm the iconoclast position, and formally condemn the cult of the sacred images; it is known from the name of the palace as the Synod in Hieria. As long as iconoclasm held sway as an official policy of the Byzantine government, this synod was legally recognized as a legitimate council. Furthermore, with its conclusion, there began a fierce persecution of the iconodules, which gave many martyrs to the Church. In The Church in Crisis: A History of the General Councils, Mons. Philip Hughes describes the 22 years from Hieria to the death of Constantine V as a “reign of terror”; the stories of the treatment meted out to the orthodox rival those of the English reformation for shame and horror. Constantine V’s traditional epithet, “Copronymus”, means “dung-named” in Greek, a reference to a diaper accident that occurred at his baptism; this was taken by those who honored the sacred images as a presage of his impiety. It occurs repeatedly in the Roman Martyrology, in reference to the many Saints killed or otherwise persecuted by him for the sake of the images. 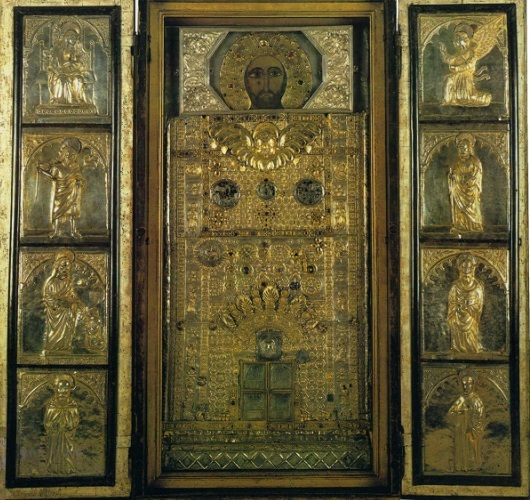 Although the term “iconoclasm” literally means “the breaking of images”, Byzantine iconoclasm also involved an attack on the Church’s devotion to relics. In fact, very shortly after Hieria, the altar of the great basilica of St Euphemia in Chalcedon was dismantled, and her relics removed from it and cast into the sea. This was the very same church at which the Fourth Ecumenical Council was held in 451; the fact that the council of 753 was not held therein, but rather in the imperial palace, says much about the baleful influence of the Byzantine emperors on the Church in that era. The date of the oratory’s original construction is uncertain; it is first mentioned in the Liber Pontificalis’ account of Pope Stephen III (768-72). Rome’s opposition to iconoclasm never wavered in the least, and at a synod held in the Lateran in 769, the veneration of images was once again upheld, although this was not its principal topic. Under Christ’s right eye is a dent which is still clearly visible, and it has been speculated that this damage was deliberately caused by an iconoclast. If the icon is indeed Byzantine in origin, it may very well be one of the many brought to Italy by those iconodules who fled from the persecution of Constantine V; images with such a history can be seen even to this day in churches up and down the peninsula. Its placement in the Sancta Sanctorum would therefore perhaps also be part of the Papal response to iconoclasm. Many of the relics formerly present in the oratory were placed there by Pope St Leo III, who was elected one year after the famous synod at Frankfurt, which, working off a very bad translation of the acts of Second Nicea, condemned that council, and what it mistakenly believed to be its teaching on the use of images. Likewise, Pope Gregory IV, who permanently established November 1st as the date for the feast of All Saints, also built an apartment for himself next to the Sancta Sanctorum, the more conveniently to go there for prayer. We may therefore consider the possibility that the Popes built the oratory of the Sancta Sanctorum as the analog at the Lateran to Pope Gregory III’s oratory at the Vatican, and very much another part of their anti-iconoclast program.